Maybe I’ve been unlucky, but I feel like I’ve observed bad sales behaviour more times than should be normal. Here’s a typical scenario: a sales person promises a customer the world, closes the deal, nets the commission, then f***s off to another company waiting in the wings, leaving everyone else to deal with the fallout and broken promises. It’s the ultimate hospital pass. Part of the problem is that the bad behaviour is self-perpetuating.1 Companies keep on setting sales people incentives that actively – though inadvertently – encourage them to put their own interests before those of their customers. When junior sales people join a company, they learn from their peers.2 Unfortunately this usually means they pick up the bad habits and outdated product patter. They also set their moral compass from the example of the supposedly more responsible VP of Sales (or equivalent), whose behaviour is often equally questionable. Take the annual gaming of the sales forecasts; prevailing market conditions and product insight rarely have any bearing on the process. Instead, the VP of Sales pitches their team’s target as low as they can, while still leaving it sufficiently plausible to keep the Chief Financial Officer or CEO from giving them grief. After all, he thinks to himself, why make things harder than they need to be? There surely must be a better way to build a better sales team. Here’s my suggestion. Dan Ariely, professor of psychology and behavioural economics, and author of the book Predictably Irrational, describes experiments he conducted to test whether otherwise honest people would cheat when given the opportunity to do so undetected. He also tested to see if it makes a difference whether they would be cheating to gain more cash in hand, as opposed to tokens that could then be exchanged for money. His findings? Pretty much everyone will cheat a little bit for extra money, but people will cheat a whole lot more when it’s for something that can be exchanged for money. In other words, cheating for tokens rather than hard cash seems to bypass our moral compass. Perhaps this would explain why office stationery is so readily misappropriated. It’s therefore not surprising that sales people game their commissions in such creative ways. The customer is not literally handing them cash in hand; there are several layers of abstraction between that deal and the commission added to the paycheck at the end of the month. I’ve watched a sales guy essentially bribe a customer into signing on the dotted line for £20k of professional services (on which there was a preferential commission that quarter) by giving them £100k of software for free. All in a day’s work, no problem here. As the product manager for several of the products being given away on that occasion, my suggestion that we were actually £80k down rather £20k up unsurprisingly fell on deaf ears. If the giveaways had deducted from his commission and quarterly revenue targets (or if the VP of Sales perhaps hadn’t condoned the behaviour), maybe the sales guy would have been inclined to do things differently. As Ariely found, most people would be tempted to act in this way if there were no negative repercussions. So to remove the temptation to game the system, why not remove commission as an incentive altogether? Put sales people on an appropriate salary like all the others who manage to do their jobs perfectly well without the extra incentive. If you absolutely, positively have to have commission incentives for your sales people, change the yardstick by which their performance is measured. Usually, sales people are tasked to close deals and secure revenue, which in turn results in some kind of proportional commission. This creates a problem. You see, most companies have forgotten that extracting cash from customers is not their raison d’être. (Or at least, it shouldn’t be.) They’re rewarding the wrong behaviour. Rather, products should exist to help people and organisations solve a particular problem, or achieve a goal more easily. If a product is doing its job well, customers should be highly satisfied. Assuming the company bothers to ask its customers for payment in exchange for this level of satisfaction, then revenue should follow, allowing it to continue creating, delivering and supporting its products in a sustainable (and ideally profitable) manner. However, this doesn’t take into account the First Law of Sales Teams, which is that they will always take the path of least resistance to achieving their commission. If the business is primarily focused on generating revenue instead of satisfying their customers, then its sales team may end up doing that to the detriment of their customers’ satisfaction. At one place I worked, the drive to close deals was so strong that customers described the sales people as “holding a gun to their heads” – figuratively, one hopes. Customers felt that their best interests were far from being served, and it was only the cost and upheaval of changing supplier that had prevented them from going elsewhere. You just know a business has lost its way when it has forgotten its ultimate purpose is to serve its customers. So rather than using the number of deals closed or revenue as the measures by which commission is calculated, why not align the sales incentive with the desired customer outcome? By using customer satisfaction as the yardstick for commission, the sales person’s incentive is always to work in the best interests of the customer. All good in theory, but in practice you need to find a truly independent way of measuring customer satisfaction to avoid falling foul of the First Law of Sales Teams again. At the same company in which customers felt they were being held to ransom, it was common practice for sales people to ‘buy’ a good satisfaction rating from customers by offering them a (bigger) discount on their purchases. In my view, the best kind of sales team is a non-existent one. Few sales people genuinely understand the tech products they’re meant to be selling, so I’d question how their misinformation assists the process. While we’re at it, we might as well wean corporate customers off their seeming dependence on the shiny-suited, German-car-driving asshats, who only turn up when they need a cash injection to get their teeth whitened. 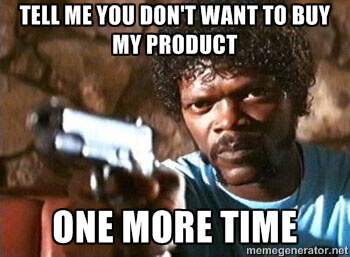 So to remove the need for a sales team altogether, why not try building products so good that they sell themselves? Usability? Just kill me now. In the realm of business-to-business (B2B) software, which tends to use sales teams more often than business-to-consumer (B2C), it astounds me how most companies can continue to churn out software that is woefully unusable and yet justify charging thousands for it. If ever there were markets ripe for disruption, B2B and enterprise software are where I’d start. With such a low bar set for usability in the B2B world, simply creating something that actually helps users to achieve their goal easily would instantly distinguish your product from the competition. Just imagine your firm’s internal procurement system being as easy to use as Amazon to find and purchase things. Or a world where SharePoint doesn’t exist. There are, of course, notable exceptions that serve to prove the rule: Zendesk (customer support), FreeAgent (bookkeeping) and MailChimp (email marketing) are a few companies with highly intuitive products that spring to mind; I’m sure you have your own favourites. And in each case you can obtain transparent pricing, trial and buy the product easily from the website without the need for any sales people being involved. Bliss. If your product truly solves a problem elegantly, then users will recognise that as soon as they’ve played with the product for a while. However, if it’s not clear to them what problem your product is solving, then it’s probably time to rethink your product (or your target market). The presence or absence of sales people won’t magically improve your product. While it’s still often the case that the user isn’t also the buyer or decision-maker, necessitating some “selling” of the merits of the product, I’d wager the pitch would be considerably more effective if it came from an objective user on the inside – or was a ringing endorsement from another customer – rather than a silver-tongued sales person. So there you have it – my suggestions for building a better sales team. Have you had any success from doing sales differently for your products? Let me know in the comments below. Fancy a bit more? 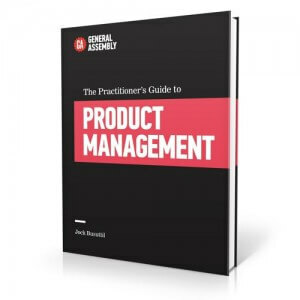 You can read more horror stories about the product manager’s occasionally dysfunctional relationship with the sales team in my book, The Practitioner’s Guide to Product Management. This entry was posted in General and tagged B2B, behaviour, customer satisfaction, Dan Ariely, incentives, metric, sales by Jock Busuttil. Bookmark the permalink.